Dethonator get two ticks from me straight off. One is for having the balls to send an album by a band called “Dethonator” to a Journey fan for review, and the other is for having a song called “Massive Demonic Killing Spree”. This is the point where I might be expected to say that these are the only positive points for this UK band with a daft name and ghoulish cover, but knock me down with a Nelson guitar solo if they aren’t pretty darned good after all. Previously knows as Kaleb (one of the few names dafter than Dethonator fact fans! ), the band play straight heavy metal with inspirations from all over the place, never copying another band but obviously just writing what they themselves like, and bugger what anyone thinks. Lead track “Wreckers” starts off with a rather amateurish couple of bars of thrashing, and I was all prepared to hate it, but as soon as the main song and vocals kicked in I realized that perhaps Dethonator would have something to offer. Jim Burton has a pretty good set of pipes on him, and although there is also some grunting it doesn’t intrude on the songs. Tristan Lineker and Henry Brooks share out some excellent guitar solos throughout the album, as well as some fast, well handled riffs that hold the songs together. There’s not a great deal of progression between the nine tracks, with all banging along at a good pace and containing enough melodic and thrashy elements to keep most people happy. It’s not, admittedly, the sort of stuff I would personally return to again and again, but as a heavy metal band Dethonator have enough talent and original ideas to really stand out above the herd. Perhaps the closest bands to them doing the rounds at the moment are Fury UK and Blaze Bayley. 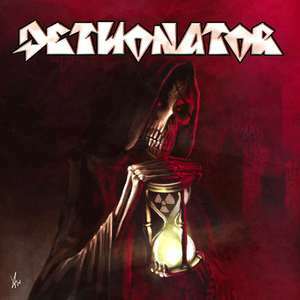 Fast and furious with melody and meat, Dethonator are worth listening to.